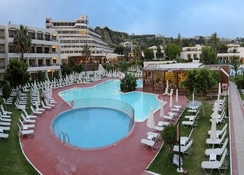 Families and couples looking for an all inclusive holiday in beautiful Rhodes can visit the Smartline Cosmopolitan Hotel. The property’s tranquil beachfront setting provides the perfect balance of R&R, while there are outdoor pools and plenty of sports facilities for active guests to get involved in if they wish. The guest rooms are relaxing and modern, while the on-site restaurant is sure to serve up something delicious for all. There is gym on-site while guests who like to explore will find plenty of attractions in the area. The Smartline Cosmopolitan Hotel is a hotel that really does provide a perfect sun-filled getaway. As far as location goes, it doesn’t get much better than this, as there is a shingle beach right on the doorstep where guests can sunbathe, swim and enjoy watersports. 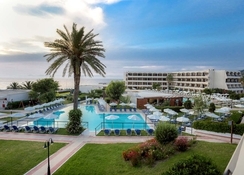 Guests are within easy reach of bars and restaurants while the centre of Rhodes is just a short drive away where guests can find top attractions including the Acropolis of Rhodes. There is a range of beaches in the area, all of which provide a different atmosphere while Rodini Park is well worth a visit. The airport is 14km from the hotel. 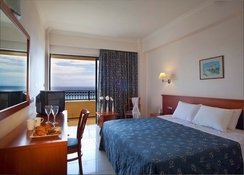 The hotel boasts an impressive 377 rooms offering Double, Twin Rooms and Family Rooms. 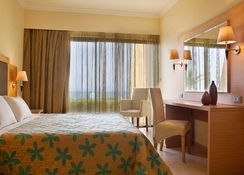 All rooms are spacious and have a stylish look and feel to them. During high season air conditioning is available while rooms come with satellite TV, mini fridge, tea and coffee making facilities, Wi-Fi, bathroom with hairdryer and a balcony. The on-site buffet restaurant ensures that the needs of all guests are taken care of when it comes to dining. It serves up an impressive choice of international dishes and local dishes for breakfast, lunch and dinner while snacks can be found at the snack bar in between meals. There is a pool bar and a main bar on-site where guests can kick back and enjoy the live entertainment. 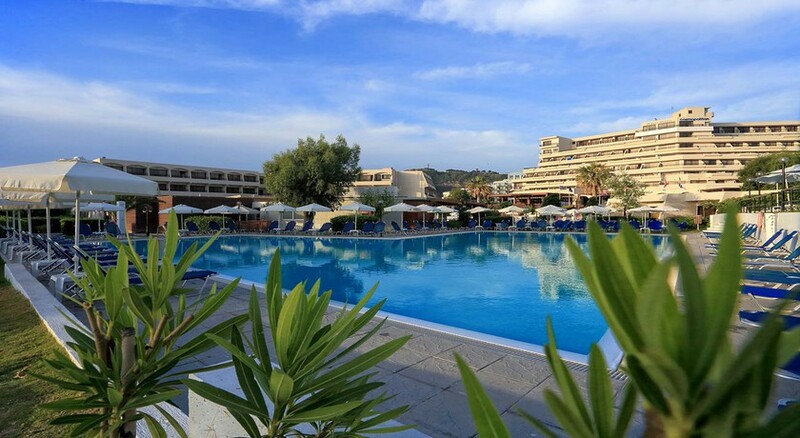 The hotel provides guests with two outdoor pools and a sun terrace which is perfect for catching some rays as the little ones play in the paddling pool. There are plenty of facilities for kids here including a mini club a playground and a games room with a range of games. For those who like to keep active then there are sports on offer including tennis, table tennis and billiards. Thrill seekers can make their way to the beach which is just a few paces away from where they can find a choice of water sports where they can get their fix of adrenaline and action.